Seven years ago, on June 30, 2001, my wonderful husband and I were married! The last seven years have been a roller coaster and through it all he has been by my side. God brought me the perfect soulmate and I am eternally grateful. We had a 4pm Roman Catholic Mass with about eighty people in attendance, followed by a sit-down dinner. I planned our entire wedding myself with little help from anyone and loved doing it! We were blessed in that our family traveled from all across the country to celebrate our marriage. Our wedding took place at my college alma mater which also was where we met during my senior year in college. I had three bridesmaids and he had three groomsmen and his childhood priest officiated. This picture of us exiting the chapel doors was put on the cover of a regional wedding magazine. Our wedding was followed-up by a honeymoon to Sandals Dunns River in Jamaica! Ahhh, nothing to do except relax on the beach! My how things have changed!! Excuse me while I clean the drool off my keyboard. Love this apron--l.o.v.e. it!! Aaaaaannnnnddd--maybe, just maybe, I'll win it! 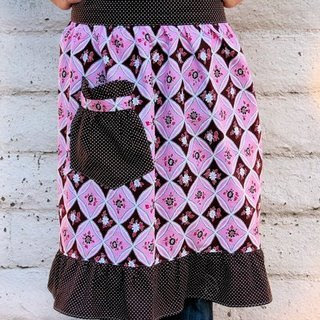 The Apronista is having a giveaway and the prize is this apron or its equally adorable (but not pink) turquoise and brown counterpart. The past week and a half has been full of medical issues for us. Last week I brought Handsome to the allergist and was expecting to have him diagnosed with seasonal allergies and possibly dust mite allergies. 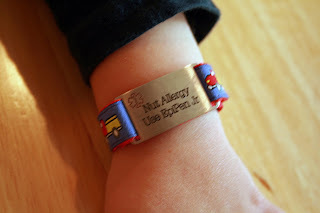 I was *not* expecting him to be diagnosed with all of the above *plus* an allergy to tree nuts (and maybe peanuts...they're not quite sure yet) that requires a medical alert bracelet as well as the need to have an EpiPen Jr on hand!! Good heavens! We go back again in a few weeks and I have so many questions for the allergist. I'm hoping a blood test (he just had the skin scratch tests, poor baby) can tell us the severity of this allergy. I've never given him nuts for a snack or anything, but I know he's had trace amounts of nuts in foods before since so many things are cross-contaminated with nuts. I found him a medical alert bracelet that he really likes though--it has trucks on it. The downside is that it is huge on his little two year old wrist. Big and bulky. I was hoping to also buy a traditional metal bracelet, but all of the chains I've found are too big for him. I'll have to keep looking. As though that wasn't enough, Princess had problems too. Last Thursday we had new carpet installed in our house because of her allergies--the old carpet was original to the house and was almost 15 years old. It still looked okay, but had a lot of dust mites and whatnot trapped in the carpet and padding. So we had everything ripped out and replaced (it was on our "to do" list, but we weren't planning on doing it *now*). I kept her outside the whole day, but I think the fumes from the new carpet still were too much for her once she came inside. Plus she had her first soccer class on Friday. Anyhow, long story short, on Monday we had to go into the allergist's office for Princess and she was given breathing treatments and started on prednisone to get her asthma under control. 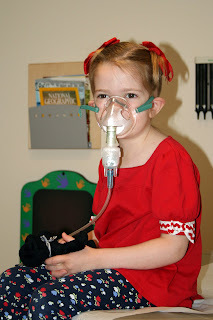 We also had a nebulizer delivered to the house. We had some more scary moments (really scary!!) Monday night, but eventually got everything under control. She's still on the prednisone (a steroid) but is responding well to it and hasn't needed the nebulizer in a couple of days. We have soccer again today--hopefully that doesn't cause a flareup. Hopefully this weekend will be free of sickness for all of us (did I mention I had a major migraine last weekend from the carpet fumes??) and we can enjoy the hot weather that is heading our way. 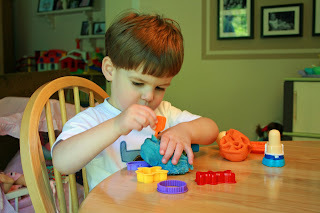 I made playdough for Princess and Handsome the other day and they thought it was fabulous!! Princess especially was amazed that I could turn flour and salt into glorious playdough! 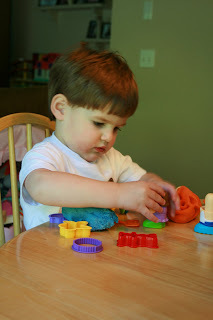 And, as a bonus, when I added the food coloring, we talked about what color the playdough would become--she correctly predicted that yellow and red mixed together would make orange. My little smarty-pants. Next time I'll have the children help me with this--this time around they were busy eating breakfast while I was making this for them. It was pretty quick and easy to do and not too messy either. Put everything except the food coloring in a pot and heat it up while stirring constantly. After a little while it will become difficult to stir. Dump it out onto a floured surface and knead the dough. Add your food coloring--and presto! You have playdough! 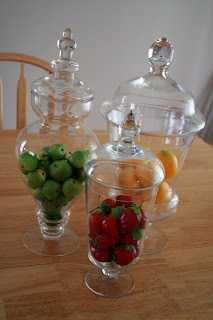 Store it in a tightly covered container or it will dry out. I split my dough in half and colored half blue and half orange. I used food coloring to color my dough but I know some people use kool-aid packets. I've never bought kool-aid in my life so I didn't have any of that on hand. It is "Talk About Tuesday" over on The Lazy Organizer and I'm talking about my garden! 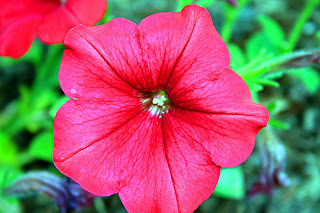 Summer has arrived and my garden...well...it barely is blooming! 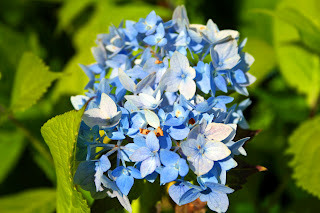 It has been so rainy and cool here...my Endless Summer Hydrangeas have been poised to bloom for weeks and weeks--and yet I have just ONE bloom on my bushes--and I have five or six bushes!! Finally at the end of this week we'll be getting some nice warm weather and SUNSHINE so hopefully things will start blooming soon! 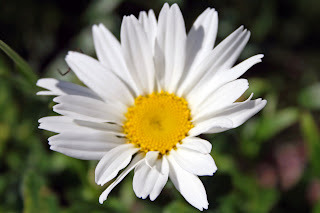 My first daisy is blooming--I can't wait until the black-eye susans follow suit. I love those flowers! I'm trying not to spend much money on annuals and instead invest that money into perennials...but I couldn't resist these Wave Petunias. 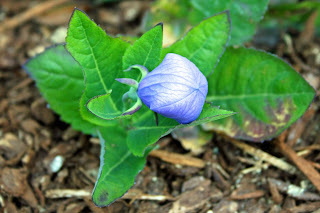 Balloon flowers are a new addition to my garden this year. I just couldn't resist them and the name is perfect for the bloom. Don't you just want to reach over and pop the flower?! 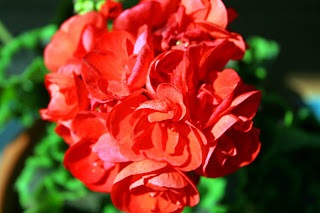 My planter boxes and porch pots are filled with red geraniums and white alyssum--looks pretty with my blue house! 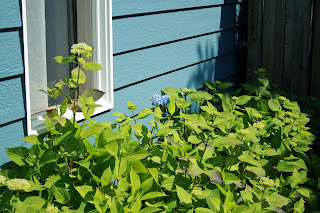 Here is my one lonely hydrangea bloom--and yet look at all the hydrangea bushes I have! There are two more in this row of bushes that aren't in the picture. Oh well, at least I'll eventually have a lot of blooms--last year I had ZERO blooms from these bushes due to some overzealous pruning the year before. They've come back better than ever this year though, so all that pruning did pay off in the long run. We lived in our house for a year before purchasing furniture for our "formal" living room. I still remember the first Halloween we lived here, one little boy came to the door, took one look in our formal living room and walked right into the house and said "Wow, you guys must be rich!!" His eyes were as round as saucers as he looked around at our empty room. I guess it all is a matter of perspective! Anyhow, a year after we moved in, we ordered furniture for the living room. 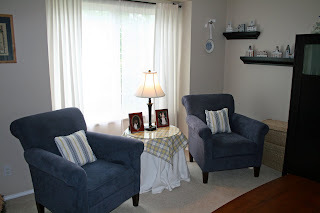 We decided to break away from our usual neutral color palette and "be brave" and go for colored furniture--so we chose a deep blue color for our sofa and two chairs. When we ordered the furniture, I told my husband that I could envision crisp blue and yellow pillows on the furniture in the summertime. Well, I bought some plush red throw pillows for those couches for Christmas decor...and never took them off! I kept spotting pillows that I loved (especially in the Pottery Barn catalogue) but the price never was right. I do have a sewing machine, but I'm not the greatest at using it. 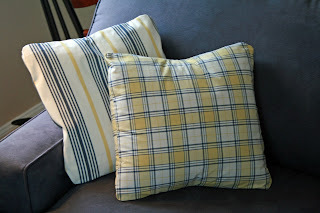 A month or so ago I spotted a great little throw pillow tutorial over at Cottage Magpie. She actually made it all look so easy!! Easy is GOOD! Then a few weeks ago I spotted the perfect blue and yellow stripe fabric in the clearance section at Jo-Ann Fabrics. Nautica brand fabric, at that. I loved it and knew it was just right for my new pillows. I picked up the matching plaid fabric on a return trip to the fabric store. And, as if that weren't enough, when I opened up my sewing machine box, I found this little piece of paper that gave instructions for threading the machine--instructions that are *totally* different from the instructions in the manual. How I've overlooked this little piece of paper for 4+ years is beyond me, but it made a WORLD of difference in my sewing. Wow! I'm really happy with the look of the pillows and they really brighten up the room. I'm happy with how the living room is coming together. 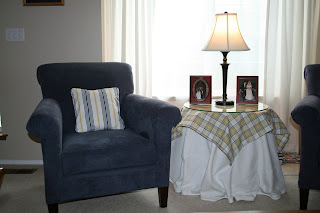 Give me your thoughts on the plaid table topper I made though--although I love the splash of color it gives me, I'm not convinced it's the right fabric for a table topper. What do you think? Does it look too much like a picnic blanket? A Tisket, A Tasket, A Tassel! Anyhow, here is my cute new tassel. I love it! 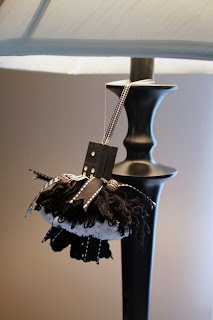 I've tried it hanging from the knob of my computer armoire as well as from one of my black lamps. I think I like the lamp location better...at least for now! It is in my living room to try to keep it semi-safe from curious little fingers. The little ones still go in the living room but there aren't toys in there so it isn't as fun a location for them as the family room. I've been tagged by Jill at Forever and Ever House for a MeMe! My first time being tagged--woohoo! 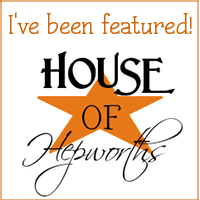 Go check out her blog and look at the cute bedding she picked out for her daughter's "apple blossom pink" bedroom. It is adorable! Ten years ago it was the summer between my junior year and senior year of college. I was spending my fourth summer working as an intern in the customer service department of our local public utility district. It was a GREAT job that paid well and looked good on a resume. My boss was super nice too. I also was getting ready for my senior year of college--I was the senior class president of my college and had a lot to do to prepare for our senior year! 2. Five things on my to-do list today...um, how about I tell you five things I've already done--I've been very busy this morning because today is the first day of our two day carpet installation! 3. What are your favorite snacks? Here is where I'm supposed to say hummus and carrot sticks with a glass of ice water, right? (See, Jill and I think alike on this one--we *know* what the "right" answer is...our real answers just aren't quite so healthy!) Truthfully my favorite snack is more like reduced-fat Cheezits and Coke Zero. Oh and some chocolate. Chocolate is a food group, you know! Ooops, that was more than five things--I started to get carried away by my new-found wealth. Now it is my turn to tag someone...so I tag *YOU*! Let me know if you accept the tag and do a MeMe so that I can come over and read your post! Yesterday I posted this lovely picture (ha!) of my laundry drying racks in my "formal" dining room and mentioned that I was planning on painting my dining room mirror and candleholders. Well, yesterday we finally had nice weather (today it is back to rain...ugh!) so during naptime I brought the mirror and candleholders outside and spray-painted them black. Woohoo! The paint job isn't perfect, but it works just fine for me--and I *love* the change! Now I need to get small white pillar candles to replace the cream ones. 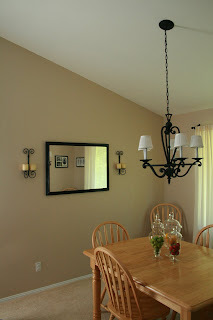 That will really pop and make it look better with my shades on the dining room light fixture. I am a million-and-one times happier with this look than I was with the blech oak framed mirror. Someday I'll be able to replace the table and chairs too, but not now. For now this table does just fine--especially since it mostly is used for craft projects and puzzles! See what other people are talking about for Talk About Tuesday over on the Lazy Organizer. The Nester is hosting a linkfest with links to imperfect rooms...here is my submission! 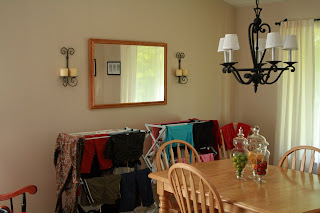 Some would call it a formal dining room...but it often is used as the laundry drying room in my house! My laundry room is a small space that also is used to access the garage and doubles as a powder room. There is NO room in there to put clothes to dry. We don't have a basement...so that leaves me with the dining room! :) Hey, it works! I line-dry almost all of Princess, Handsome, and my clothes, so the dining room has clothes racks in in 3/4 of the time. I took this picture last night, as a matter of fact! 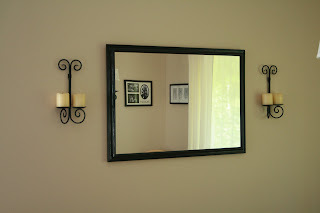 As an aside, I think I'm going to paint the mirror frame and candle holders black and see if I like that better. I'm so over the oak framed mirror. Blech! I bought black spray paint at Home Depot over the weekend to try out. Oh, and I'm in love with my centerpiece. I just did that last week and I'm quite happy with it. I like the color it brings to the room--because when the room is empty of laundry (ha!) it needs that pop of color. The table and chairs aren't especially formal--they were in our kitchen at our old home--but they're what we have for now. 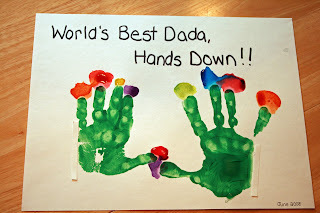 Happy Dada Day!! Yes, that's what we call it in this house as both children still call my husband "Dada" instead of Daddy. We are blessed to have him and we sure hope he knows it! We love you! Princess and Handsome painted this card/sign for him on Friday and surprised him with it today. Can you believe how big Handsome's handprint is? His is the one on the left side of the paper--I was shocked to see it is almost as big as his sister's! Ahhh, what a lovely family picture. Princess and Handsome were ready for us to eat as soon as we arrived at the restaurant after church--definitely not in the mood for picture taking! Oh well! 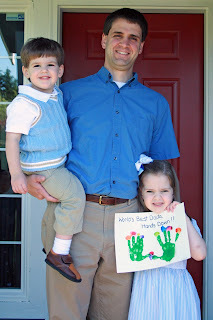 I do like this last picture though of me with my sweet babies. Love them!! Latest movie in a movie theater? Um, no clue! 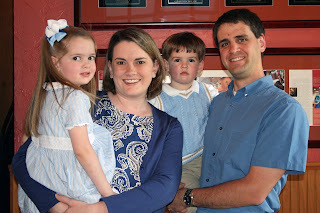 It was 4.5 years ago in November of 2003--before my daughter was born. Which food don't you like? Spicy anything...my tongue is wimpy! Favorite sandwich? Turkey, lettuce, tomato on whole wheat--no condiments! What are your favorite clothes? I love capris! Favorite time of day? Lately it is naptime! Are you a morning person or a night owl? I'm a middle of the day person! Any exciting news to share? Nope. What did you want to become as a child? My mom says I wanted to be a waitress so that I could help people. I love that story. Best childhood memory? The moment my mom told me we were going to Disneyland! Have you ever been in a car accident? Yes, but not one that was really bad. Favorite day of the week? Friday--we have the whole weekend to look forward to. Favorite - Hot dog or Chinese food? Neither! Blech. Although I do occasionally eat a Costco hot dog. Do you own a bike? Yes. What are you up to now? Getting ready to go to bed. My house has many walls but only one of them is my favorite. I love this wall--I smile every time I see it. Sometimes my husband sees me sitting on the family room couch and says "you're looking at the wall again, aren't you." He's a smart man--he knows I love that wall! I love the collage of my children, I love the nice uniform grouping, and I love that this was an ultra-low budget project. I did this project back in very early December and I love it just as much now as I did in December. Prior to December I had the frames up in a collage, but the arrangement was different (more random) and I didn't have the darker brown paint behind the frames. The week before Princess's 4th birthday party I decided that I *had* to redo the wall. My husband is a patient man and humored me. He used the laser level and painters tape and taped off the wall according to the vision I had in my head. 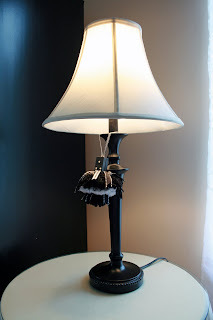 Then I grabbed the sample can of paint that I had for our master bedroom and used that to paint the darker brown. 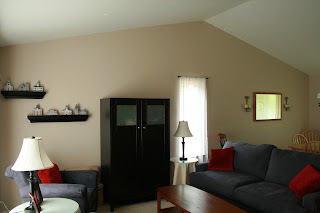 After lots of touch-up, we hung the frames back up (and I finally updated the pictures!) and voila! My favorite wall was born! Shannon at Rocks in My Dryer is hosting Works for Me Wednesday and she posted about her newly organized fridge...which made me think that *of course* the blogosphere would *love* to see MY organized fridge. (yeah, right!) 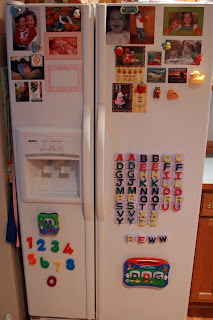 Anyhow, here is my fridge. I love having it neat and clean and organized--it just makes me happy to have a corner of organization hidden behind what can sometimes be a mess of magnets. And here is the inside of the fridge side. The top shelf holds eggs, applesauce, our Costco size bag of shredded cheese, and baby teethers--the teethers come in handy for when the children bite their tongue or the inside of their cheek, or have their teeth cut their lips when they fall. Shelf two holds our bajillion containers of organic milk (thank you Costco!) and other beverages. The top drawer holds lunch meat and string cheese. Shelf two holds dinner fixings--chicken alfredo for tonight and some meal I pulled out of the freezer for later in the week. The little drawer has lunch meat and string cheese, the bottom shelf has bread and hamburger buns, the big drawer has fruit and fresh veggies, and the bottom drawer has meat and Smart Dogs (tofu hot dogs)--my 2.5 year old LOVES Smart Dogs but hates real meat. 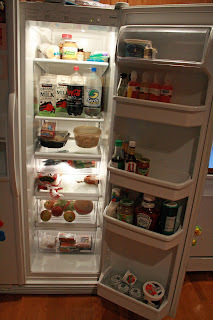 The door holds condiments, yogurt, and some Pedialyte leftover from Mother's Day week when we all were vomiting our brains out. Blech! The freezer isn't too exciting. The top shelf is the waffle shelf--Vern's Organic Waffles were on sale this week, so I bought six boxes--my children loooove those waffles for breakfast! 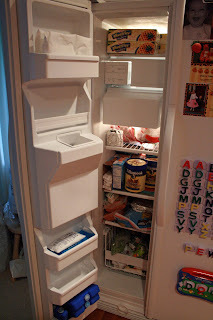 Then we have the icemaker which takes up WAY too much room in the freezer. Then the bread shelf--I buy our organic multigrain bread at Costco so we always have extra loaves in the freezer. Next is the ice cream and frozen Lean Cuisine shelf. Nice juxtaposition, eh?! It is my small spot of humor in my freezer. ;) Then the frozen meat shelf (mostly chicken), and the bottom part of the freezer actually is a pullout drawer that I never pullout except when I'm cleaning out the freezer. Anyhow, it has frozen veggies. The door of the freezer just has icepacks right now--the spots in the door are so small that I can't fit much in them. 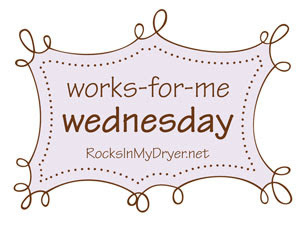 Today, on Talk About Tuesday, I'm talking about mistreatments! 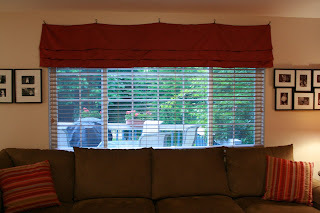 If you know the Nester, then you already know what I'm talking about--aka, the world's easiest window treatments! We moved into this house 4.5 years ago. 4.5 years ago (while 36 weeks pregnant and suffering from pre-eclampsia and pregnancy induced hypertension that was exacerbated by a cross-country move...but I digress) I tore down the vertical blinds on the windows in my kitchen and family room. My husband was not thrilled to come home and discover his hugely pregnant wife (hello, 60+ pounds of baby weight and water weight!) opted to do this instead of keeping her feet up as instructed. I say that he just didn't understand the powerful nesting instincts that Mother Nature was inflicting on me. He claims that Mother Nature had nothing to do with it--it was all about my *strong* dislike of vertical blinds. He may have a point. Anyhow, for 4.5 years these three windows have been naked. They look out into our backyard so there really isn't anyone who can see in except for one set of neighbors and they don't go in their yard very often. I finally decided that enough is enough! 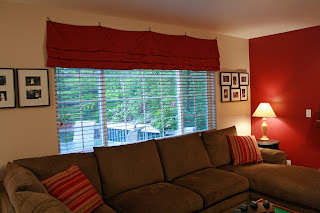 I special-ordered wood blinds for the *huge* window in the family room. That set me back almost $300 and that was after a 60% off sale--it was a necessity though; we bought a new couch for the family room and didn't want it to fade the way our old couch faded. 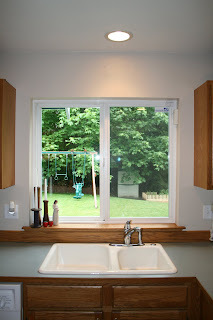 Now I need to wait and save up for the sliding door in the eating nook and the window over the kitchen sink. 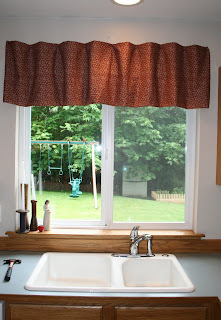 In the meantime, I'm tired of naked windows--so I've started mistreating them! Here is the kitchen window--the before picture shows my naked (dirty...it's been too rainy to clean outside) window with some of my collection of strawberry plates. This is the bare naked picture--plates are down and I decided against filling nail holes and removing the anchor from hanging the clock. Here is the first try--I like the mistreatment, but I think the mistreatment should go higher. Oh, and please notice how the light over the sink is centered on n.o.t.h.i.n.g. That is par for the course for this house. 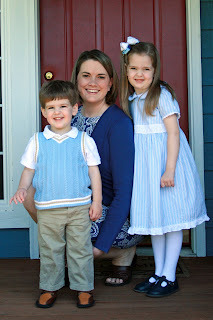 We love our little house, but many things about it drive me crazy! Oh, and yes that is my girly little red hammer on the counter. My husband hates it. And here is what it looks like today--I raised the mistreatment up and I love it! Our window looks sooo much bigger. My only disappointment is that the adorable rag garland I made to hang across the window looks dorky. I stuffed it in with my sewing materials in the hope that out of sight would equal out of mind...but it isn't working. Working with the calico in the kitchen was so easy, I decided to see what I could do with the silky stuff I bought on a whim. It was in the decorator fabric clearance section and was on sale on top of that. It was the exact shade of the accent color in my family room so I had to buy it...but I bought the entire amount left on the bolt and I wasn't sure it was enough for a mistreatment. Still, I opted to give it a whirl. No nails this time though--just straight pins and drapery clips. I'm not as sold on this window mistreatment, but I like it better than a naked window, that's for sure! Click on the pictures to enlarge them and get the full effect. I still need to mistreat the sliding doors off the breakfast nook. 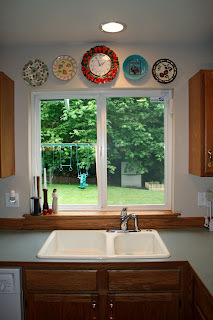 I think I'll do the same thing that I did on the kitchen sink window. I'd rather have long panels down the sides of the door, but my 2.5 year old son would destroy those--he already puts sticky finger prints on the door while he eats because his high chair has to be right next to the door. 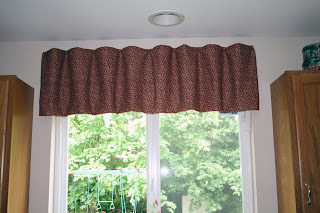 Long curtain panels definitely are out of the question for now. We're having record low tides around here--the lowest tides since the early 1900s!! Wow! Anyhow, on Friday afternoon we went to a state park on the outskirts of town to see what the lowtide left exposed. 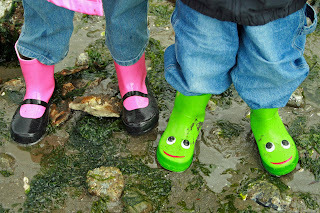 We wore our boots and hit the beach for some exploration! 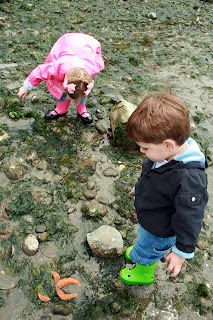 We turned over rocks and looked around the edges of the eel grass. 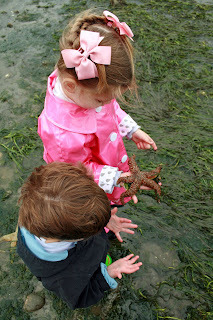 We found lots of starfish--lots and LOTS of starfish. Sea anemones, moon snails, hermit crabs galore, sand crabs, and all sorts of other sea life that I can't name for the life of me! Princess and Handsome had a fabulous time. We explored for two hours before I forced them to leave because it was getting late and they still needed lunch and naps. 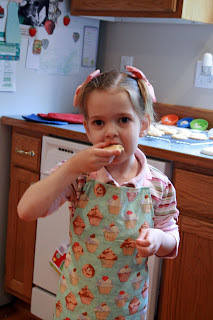 Princess and I made cookies on Friday morning--snickerdoodles! I always think of my grandpa when I make snickerdoodles and I'm so glad my children love them so I have an excuse to make them on a regular basis. 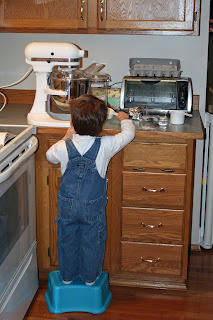 Princess dumped ingredients into the mixer and helped read the recipe too. 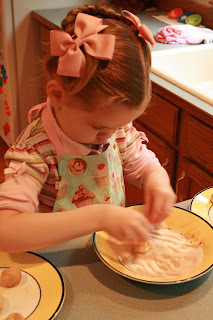 The part she is an expert at, however, is rolling the dough balls in the sugar/cinnamon mixture. She loves doing that part! Handsome supervised and banged things on the counter. And, of course, lots of sampling of fresh-baked cookies had to happen! I've been busy decorating at home! On Wednesday I painted and hung some barn stars--almost all of which I bought off eBay as they seem to be scarce in my neck of the woods. I used the Nester's painting technique -- aka I painted with my fingers and Bounty papertowels. Boy oh boy did that make clean up a breeze! No paint brushes or anything of that sort to deal with! The stars started out a mix of colors; one was red, most were black, one was cream and one was yellowish. I painted them with a mix of white and blues. The first picture is my formalish (really there isn't much formal about it!) living room with nothing on the wall above the armoire. 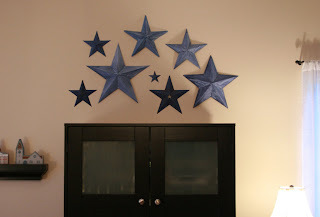 And, obviously, the second picture is of my freshly painted and displayed barn stars! I love them! The top of the armoire still needs some decorating, but this is major progress. It is nice to have some color on the walls. Next I need my husband to cut me some wood that I can paint black and fit inside those little display ledges off to the side of the armoire. The village of houses displayed there is my husband's hometown in Massachusetts...but right now they're recessed into the shelves a bit and I'd really like them to sit up a bit.